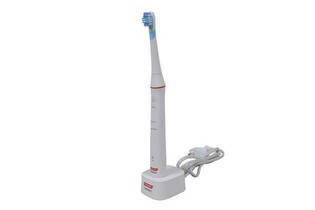 Snapshot: The Colgate Pro Clinical 350 Whitening electric toothbrush has a sonic brush action. How well does it clean teeth? Extremely fast at recharging battery (less than 10 hours). Excellent at keeping battery charge. Very easy to attach and remove brush head. No pressure indicator or travel case. Only has 2 speed settings. From shavershop.net.nz only. Replacement brushes are sometimes out of stock.